The PTSA helps to fund many essential programs and services at Bryant. Every child at the school benefits from the PTSA’s generous contributions, which include support of art instruction and materials, classroom supplies, field trips, playground supervision, technology, teacher training, volunteer coordination, tutoring and academic support, instrumental music, as well as community events such as Writers’ Celebration and Science Fair. Participation is online this year. Please go to our fundraising website, select your student's class to participate (and get your classroom one step closer to the pizza party). Contact Fundraising Chairs Leeann Huntington, Sara Fenzl and Allison Broadgate for more information. Visit the PTSA meeting schedule to view budgets as they're presented on a monthly basis. 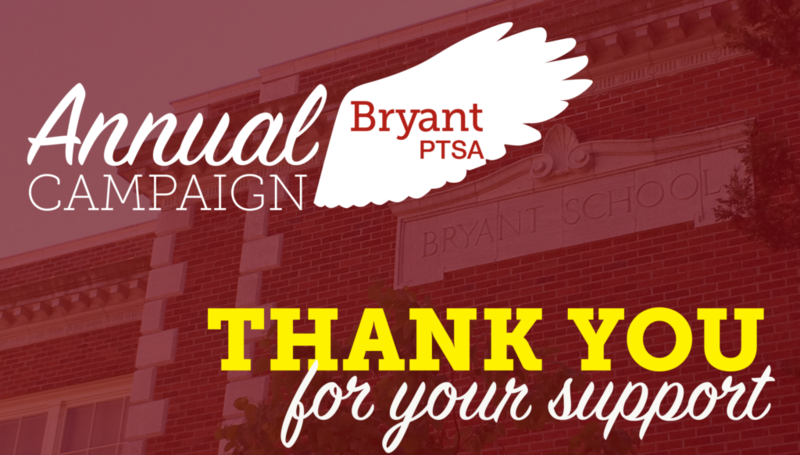 This is the primary fundraiser for the Bryant PTSA and the whole school gets involved. We raise the vast majority of the PTSA budget through this direct appeal. Our spring carnival is an event that the entire community looks forward to. This celebration brings students, teachers, staff, friends, family and neighbors together. The Bryant PTSA hosts an Online Auction, which offers many once-in-a-lifetime opportunities.